Upon unwrapping HomePod, the top of the box slides off to reveal the speaker sitting upright. The top touch panel, which is entirely optional to use, comes covered in plastic, and the fabric-covered power cable is wrapped, but other than that, the HomePod is naked in the box. Don't be fooled by its small size. HomePod fits an impressive amount of kit into a compact, dense package. It's heavier than you'd expect, which undoubtedly helps the audio pack a serious punch. Setting up HomePod is about as simple as you can imagine, even by Apple's standards. Simply plug it in and hold your iPhone near it, and the process begins. Presumably borrowing data from the iPhone it is paired with, HomePod doesn't ask for much from the user. In fact, it doesn't even have you say a series of "Hey Siri" commands to help it recognize your voice -- it just works. There are some important security options asked as initial prompts, including whether to allow anyone within range to hear your text messages, create reminders, or access notes. You don't have to worry about calendar entries (yet), because there is no support for it on HomePod. After breezing through the simple setup process, Siri asks the user to say the command "Hey Siri, play some music." Presumably if you have Apple Music, it plays tracks it thinks you like. Since I use iTunes Match instead, the HomePod simply began playing my entire iCloud Music Library on shuffle. When playing music, HomePod's top display simply shows plus and minus buttons for volume control. Because it's a screen, and not actual buttons, the top turns into the familiar Siri waveform graphic when speaking to the personal assistant. Users can also tap the top of the HomePod to pause music, or hold it to manually invoke Siri. But considering everything with HomePod can be controlled by voice (including setting the volume and even asking for the current volume level), users can feel free to put the speaker somewhere out of reach if they have no intention of using the display. On an iPhone, HomePod has a few ways it can be controlled -- though I should note my iPhone X is on iOS 11.3 beta 2, meaning the experience may be different for people using the HomePod on day one without beta software. If you open the Music app on your iPhone while listening on HomePod, it does not, by default, show what is playing on the speaker. Instead, users must open the "Now Playing" view, and tap the AirPlay icon at the bottom. There, a popover shows separate media players for iPhone and HomePod. By tapping on HomePod, the Music app switches to control of the device specifically. You can return to browsing your music on your iPhone and it will play to HomePod. Users can then go back to the AirPlay view and switch back to iPhone music control if they want to play music to another device, including on the iPhone's speakers, or a pair of connected AirPods. Later this year, when iOS 11.3 is made public and the HomePod is also updated, AirPlay 2 will be available. This means users will be able to stream music to multiple HomePod units at once, or even combine playback on HomePod with other AirPlay 2 devices, like the Apple TV. For now, it's one HomePod only, and I couldn't find a way to stream to both my Apple TV 4K and HomePod. HomePod can also be accessed through the Home app. In the initial setup process, HomeKit users are presented with a list of rooms already established in their smart home, and when you open the Home app, you'll find HomePod in its rightful place. 3D Touch on the HomePod icon in the Home app and users are presented with two options: Alarms and Details. In Alarms, users can tap the plus button in the upper right to manually add them. Under Details, the Home app allows basic HomeKit configurations like room and whether to include in Favorites, as well as options for music and podcast playback and Siri control. Apple also offers Accessibility options in here, and future HomePod firmware updates will be available in the Home app. It should also be noted that HomePod will act as a HomeKit hub, allowing users to access smart home accessories while away from home, like lights, switches and door locks. Finally, on the main Home app screen, users can quickly tap on the HomePod icon to quickly pause music. Notably, however, you cannot use HomePod with triggers in HomeKit, meaning automatically pausing music when you leave home is off the table (for now). AppleInsider will have much more on the HomePod in the coming days, including our full in-depth review. Yes. It works as an AirPlay speaker from an Apple TV. Looks good. Needs a banana for scale. What I'd like to see is the ability to control the ATV through the HomePod / Siri. Why didn't you remove the plastic film from the top before taking the photos? Does the HomePod consume one of the ten (10) device licenses authorized to access iTunes Match? Is there some reason why every single review of this thing doesn't show an item next to it for scale? I find it really odd that I've read 3-4 reviews of this thing but I have NO idea how big it is because every single review shows the device by itself. Take a picture of it with an iPhone sitting next to it, or a business card, or *something*. Even a banana would work, yes, but they come in different sizes, but it would at least give us an idea. Video is forthcoming as part of our review, but we have dedicated video guys for that. Not my area of expertise. The plastic was only in one picture to show the unboxing process. Plastic is removed in all other images. It will work as an AirPlay speaker for now, but I believe the soundbar thing might need to wait for AirPlay 2.0 coming later this year. Apparently there are some latency issues with AirPlay 1.0. For those asking about scale look at the specs. But I tend to agree it is important to have scale here as this thing is small and heavy. I messed with mine for about an hour today and have the following points. 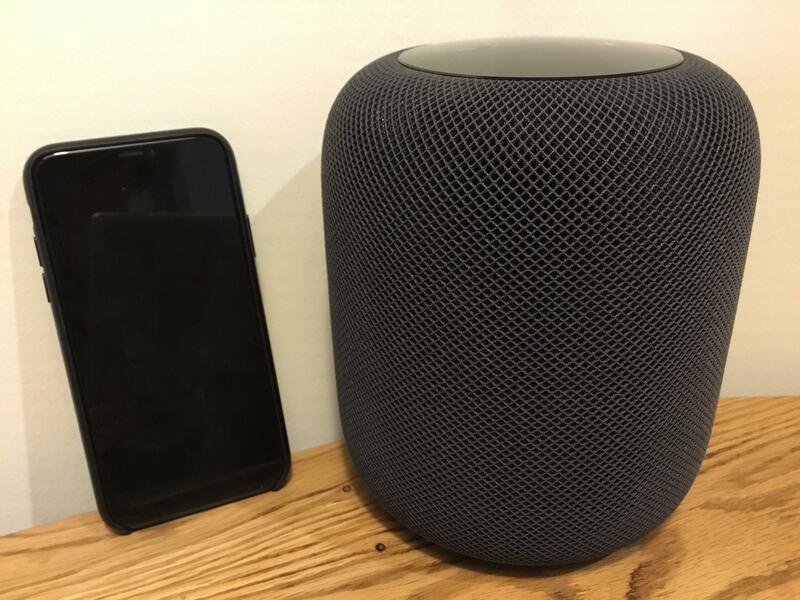 The sound will not disappoint...I was super impressed with how easily it picks up voice commands from what I tested was 40 feet with music playing I used a normal voice and asked "Hey Siri, How is the weather"...homepod picked it up no problem. So far I am super happy with this purchase. Sorry, I was just being a smartypants. I do think scale should be shown but was going for humor there. Yeah I read the specs but I'm a guy, so my idea of size is skewed. Mine is in a UPS truck circling the neighborhood. Can’t wait. I like the idea of a quality speaker primarily, and I think Apple was wise to focus on that aspect because Apple knows that for the vast majority that will be the primary function of the HP and few months down the line. Generally speaking I think a screen is so useful it borders on essential on any personal or family assistant, and even for the HP. (What podcast/radio station / newsfeed / music is currently playing?). I can see the attraction of extending my laziness to the point where I only need to say 'raise the temperature a notch', but I wouldn't make a purchasing decision based on that ability. Still, I am excited to see where this goes. I'll likely be at work when mine gets delivered (I taped the "pre-sign for delivery" form to my front door before I left this morning) then I have to get a hair cut. I, too, am anxious to begin using it. It's been a while since I've been this excited about an Apple product even though I have no idea exactly how I'm going to use it just yet. Apple seems to have a knack for being able to sell me things even before I know exactly what all they do. Texts and such are only announced if you ask for them. And they can only be received from one person/device/account. And you have to opt in for the feature upon initial setup. As for music, anyone will be able to stream and control it, even if your phone isn't nearby. But their music selections would, presumably, affect the recommended "For You" content on your account, or whoevers is linked to it. Multi-user support is sorely lacking, and I have to imagine it's a top priority for Apple. How does Hey Siri work with multiple devices in the same room? Is it still buggy? As it is now for me on the latest software, if I raise my wrist and say Hey Siri to my Apple Watch, my iPhone also activates Siri at the same time. Will I now have three devices activating Siri every time? Looking forward to getting one soon. I do have a question, though, and maybe it will be covered in the full review. How does/will it respond to multiple voices? By design, this is not a personal device. It sits in a home and should be able to be used by more than one person. Can Siri be trained to recognize more than one voice? And if it recognizes different people, can it access different music profiles, different reminders or text messages based on who is making the request?